The period covered initially by Arts:Search is 1903- 1908. Available soon. Monthly. The Architectural Review was one of the leading American architecture journals. It contained long, well-illustrated reports on the latest work by U.S. architects and architectural practices. Each issue included a series of detailed plans of current or recent architectural projects. The 1904 volume contains a special feature on the Louisiana Purchase Exposition in St. Louis. 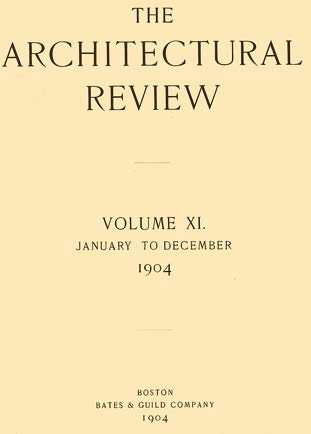 The Architectural Review merged with American Architect in 1921.